Westholme’s explorers are back from Borneo! 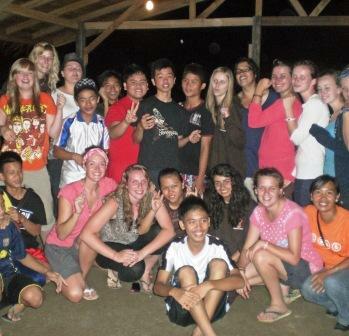 On 9th July 2010, 13 intrepid students accompanied by Miss Edgar, Miss Entwistle and Dan (the Mountain leader) set off to Borneo in South East Asia to undertake a month-long expedition. The month was split into four phases: Community, Wildlife/Environment, Mountain/Adventure, Ocean. The Community phase took place in a small village in northern Borneo called Bongkud where the group lived amongst the local community and helped with projects to improve the quality of life in the village. Tasks included digging the foundations for the new community centre and toilet block, constructing a water feed tank (as 25% of the village does not have running water) and building a kitchen garden so the camp can grow its own fruit and vegetables. The girls had the opportunity to teach English to local children and to play rounders, badminton and football. The members of the community and village chief made everyone feel incredibly welcome and in return for our hard work the group were taught how to dance, play the gongs and make bracelets from local beads. Girls also had the opportunity to attend the local church where they performed their favourite hymn, ‘Shine, Jesus Shine’! The wildlife/environment stage took place in the rainforest in the east of the island near to a community called Batu Puteh. The group lived in tents in the jungle, collected seeds for the tree nursery and planted almost 400 trees. The tropical rainforests in Borneo are facing destruction as the government has deforested vast areas to set up palm oil plantations. This devastation of the rainforest contributes to the destruction of habitats of thousands of species including the incredibly rare orang-utan. However, during the jungle safaris girls were lucky to see the rare animal in the wild as well as the proboscis monkey. As part of the wildlife phase we visited the orang-utan sanctuary at Sepilok which cares for orphaned orang-utans and tries to rehabilitate them into the jungle. There were two parts to the adventure phase of the trip: the jungle trek and mountain ascent. Westholme students successfully climbed Mount Kinabalu which, at 4095m, is the highest mountain in S.E. Asia. There was also a four-day jungle trek which was particularly tough as we had to carry all supplies and hammocks for the four days. Parts of the trek were incredibly steep and muddy. At times morale was low but when we were told that the trek formed part of the prisoner of war death marches organised by the Japanese during World War II, we were grateful of our kit, boots, hammocks and food supplies. At the end of the expedition there was time to enjoy our R & R days on the beaches of tropical islands off the coast of Borneo – true paradise. Westholmers are now looking forward to the next expedition in 2012 – hopefully to Tanzania or Cambodia!